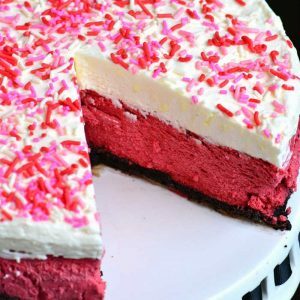 Smooth and rich Red Velvet Cheesecake makes a perfect dessert for Valentine’s Day, Christmas, and many other celebrations. This luscious cheesecake is inspired by a traditional red velvet cake and made with buttermilk, vinegar, and cocoa powder. On top, you will find a layer of soft cream cheese frosting. 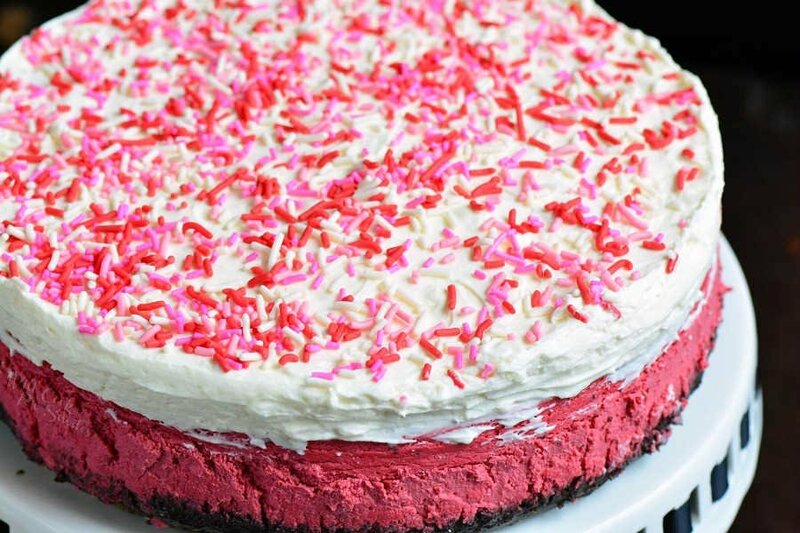 This cheesecake can be decorated with sprinkles, white chocolate shavings, pieces of chocolates, or just frosting. 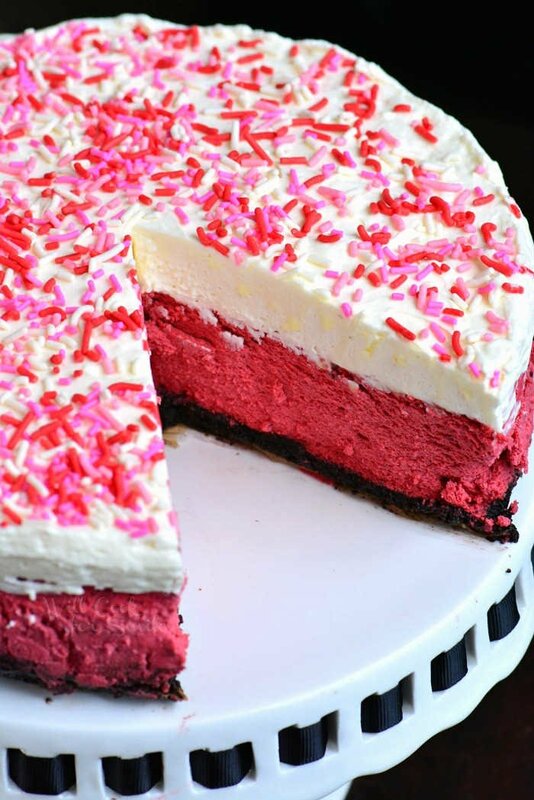 This wonderful cheesecake is inspired by the classic red velvet cake. What is red velvet anyway? Red velvet cake is a special kind of cake that is traditionally made with buttermilk, vinegar, and cocoa powder. Even though it didn’t start that way, there is usually a generous addition of red food coloring to give the cake its bright red color. 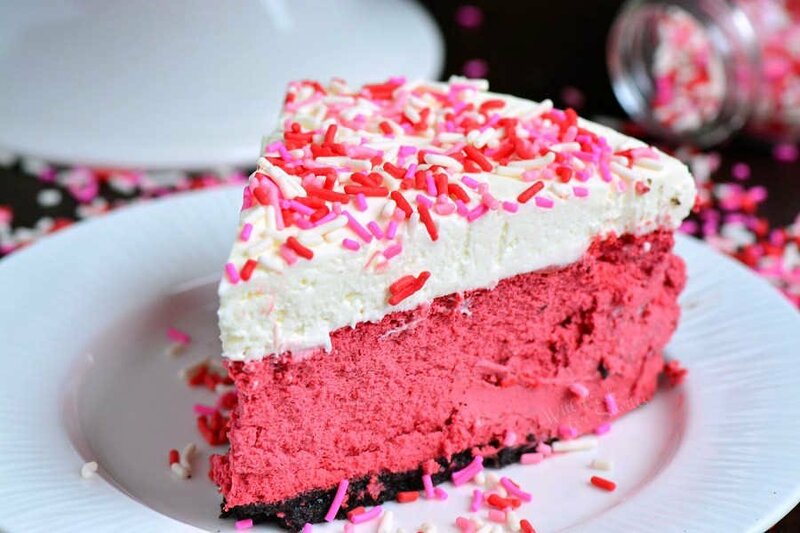 Red velvet desserts are not actually considered chocolate desserts because there is not a lot of cocoa powder added. The amount of cocoa is just enough to add some chocolate flavor but not even close to make it a fully chocolate dessert. This cheesecake combines all those traditional ingredients like cocoa powder, buttermilk, vinegar into a smooth and rich dessert. It’s also frosted with a tasty cream cheese frosting. It’s a beautiful cheesecake that can be decorated differently to compliment any holidays and occasions. WHAT KIND OF FOOD COLORING TO USE? When adding food coloring, start with 1 tablespoon and make sure it’s mixed throughout the batter. If you feel like you want a deeper color, add some more food coloring. Make sure that each addition is mixed in throughout before adding more. Do note that adding food coloring to the cheesecake does not look the same as adding food coloring to the cake. Cream cheese doesn’t translate color as true as the cake. The color will be lighter and more of a shade of pink. It will be a deeper shade with some more coloring but you will unlikely achieve the same exact color of a red velvet cake. Cream cheese frosting makes the best compliment to this cheesecake. You can simply pipe frosting with a decorative tip on top of the cold cheesecake or you can add some more decorations over the frosting. 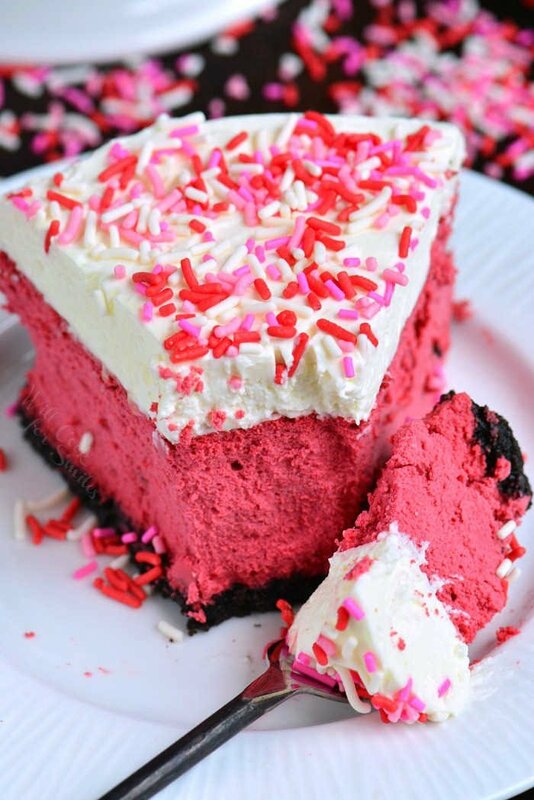 For Valentine’s Day, you can use red, pink, and white sprinkles. 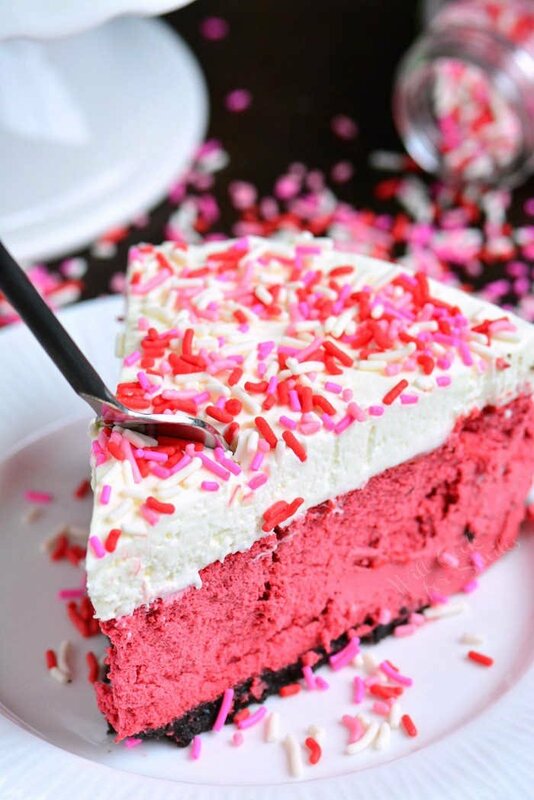 There are heart shaped sprinkles that you can get at most grocery stores around Valentine’s Day and use those as decorations. Chocolate shavings will also look beautiful on top. To make chocolate shavings, you can use either a vegetable peeler or a large cheese grater. Make sure that chocolate is not cold or it will crumble when trying to shave it. White chocolate shavings will make a pretty decoration if serving the cheesecake for Christmas. This luscious cheesecake is inspired by a traditional red velvet cake and made with buttermilk, vinegar, cocoa powder, cream cheese frosting. Pulse Oreo cookies for crust in a blender until it's just crumbs. Mix Oreo cookie crumbs and melted butter in a mixing bowl until thoroughly incorporated. Spread crumb mixture in the bottom of the springform pan, evenly, pressing it over the bottom and a little up the sides. In a bowl of an electric mixer, beat cream cheese on medium-high speed until smooth and fluffy, 2-3 minutes. Scrape sides and bottom of the bowl and beat for another minute. Add cocoa powder and sugar and mix until combined. Pour in buttermilk, vinegar, vanilla extract, and heavy cream and beat until all mixed very well. Scrape sides and bottom of the bowl and mix. Pour in 1 tablespoon of red food coloring and mix until evenly incorporated. If deeper color is desired, add some more food coloring. Transfer the batter into the springform and spread it evenly. Bake for 80-85 minutes. Turn off the oven and open the oven door half way. Let cheesecake rest for about 10 minutes and take it out of the oven (out of the roasting pan and carefully take off the foil). Beat butter and cream cheese together on medium-high speed until smooth, 1-2 minutes. Lower the speed to low and beat in powdered sugar and vanilla. Turn up the speed back to medium-high and beat for about 3-4 minutes, until the frosting is light, smooth, and fluffy.